An introduction to the most commonly requested title insurance endorsements. Title insurance is issued utilizing standardized forms of policies and endorsements. The most commonly used forms for commercial properties are those promulgated by the American Land Title Association (ALTA) which is a nationwide title insurance industry group. 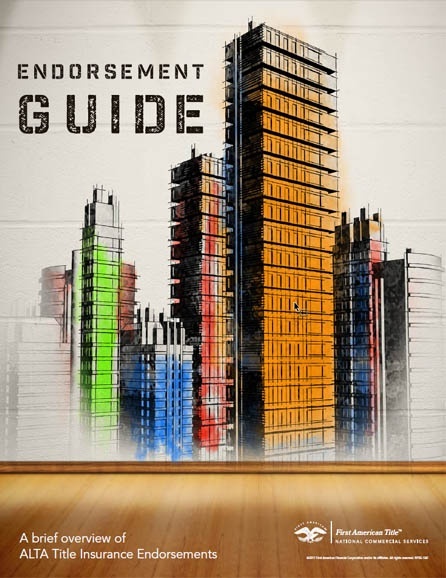 The Endorsement Guide is intended to serve as an introduction to the most commonly requested title insurance endorsements in today’s market. It contains the text of each endorsement as used in the industry, and is followed by a brief explanation and commentary. © 2005-2018 First American Financial Corporation and/or its affiliates. All rights reserved. First American Title Insurance Company makes no express or implied warranty respecting the information presented and assumes no responsibility for errors or omissions. First American and First American Title is a trademark owned by First American Financial Corporation.